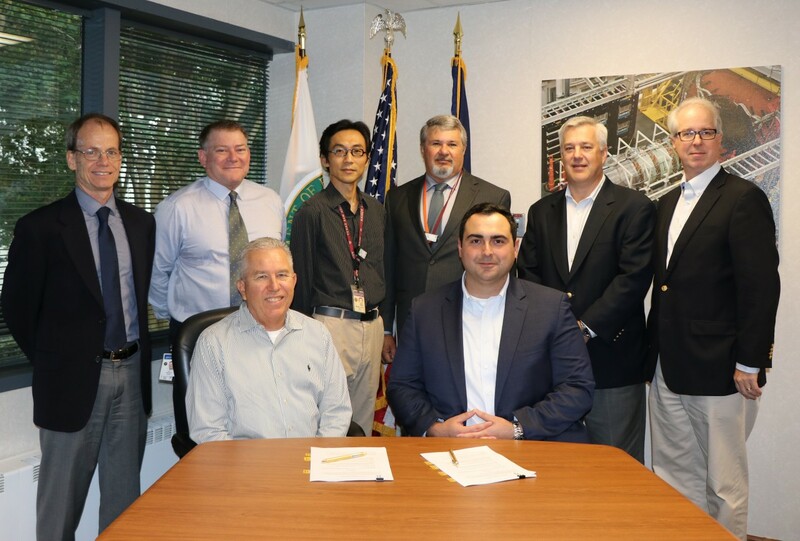 NEWPORT NEWS, VA – On Sept. 27, 2018, Dilon Technologies signed a licensing agreement with Jefferson Lab for use of the patent Apparatus and Method for Variable-Angle Slant-Hole Collimator (VASH), a technology with great potential to improve breast cancer detection while lowering the radiation dose to the patient. The patent was generated from work done at Jefferson Lab by inventors Seung Joon Lee, Brian J. Kross and Jack McKisson. The three inventors are members of the Jefferson Lab Radiation Detector and Imaging Group. The collimator was built at Jefferson Lab and tested in collaboration with the University of Florida with funds provided by a Commonwealth Research Commercialization Fund grant from the Commonwealth of Virginia’s Center for Innovative Technology, with matching support provided by Dilon Technologies. While mammography is the gold standard for breast cancer screening, about half of all women will receive an indeterminate result that requires additional diagnostic imaging, particularly women who have dense breast tissue. Imaging based on nuclear medicine is currently being used as a successful secondary screening to find cancers that are otherwise hidden in women with dense breasts and at higher risk for developing breast cancer. Dilon plans to use this new technology to improve this imaging technique, known as molecular breast imaging (MBI) or breast specific gamma imaging (BSGI). The new technique will have better image quality, depth information within the breast and reduce the radiation dose to the patient from the procedure. “This could be a game-changer,” said Dane Popovski, Chief Operating Officer at Dilon. Tests have already demonstrated that using the VASH collimator with an existing molecular breast imaging system provides six times better contrast of tumors in the breast. This could potentially reduce the radiation dose to the patient from the current levels by half, while maintaining the same or better image quality. Contact: Deborah Dowd, Jefferson Lab Communications Office, 757-269-7180, dowd@jlab.org.